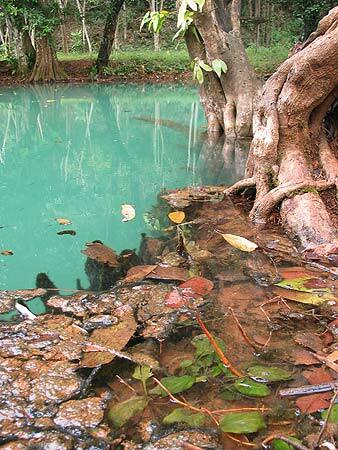 T. espei inhabits this karstic pool in Krabi province, southern Thailand. Note the dense growth of Cryptocoryne cordata at the margin. 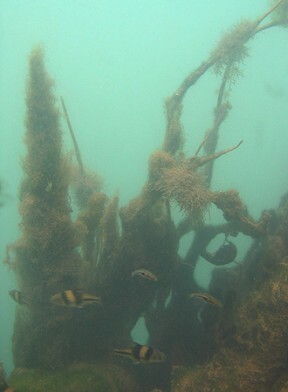 Other species inhabiting the pools include Betta simplex and Barbodes lateristriga. There appear to be two main populations of this species, one in the far southwest of Thailand and the other in the southeast of the country around the border with Cambodia. Its range is known to extend at least as far as the Prek Tuk Sap river basin near the coastal town of Sihanoukville in southwestern Cambodia while reports from Laos probably represent cases of mistaken identity. More recently a population has been discovered on the nearby island of Phu Quoc, Vietnam. The colour of the fish can vary depending on the locality; for example specimens from Krabi province, south Thailand have a more intense reddish colouration than those from Chanthaburi province in the east. Varies with locality. It most commonly inhabits gently flowing sections of forest streams and tributaries where submerged aquatic plants grow thickly. The water is sometimes stained faintly brown/yellow due to the presence of tannins and other chemicals released by decomposing organic matter and the substrate scattered with fallen leaves, twigs and branches. In Krabi province, southern Thailand it can be found living in a particular karstic (limestone) area with neutral to alkaline water (pH 7.0-7.4). The habitat consists of a series of deep limestone sinkholes forming pools at the surface, plus a small ditch which acts as an overflow from the pools. The water is very clear and is tinted a bright blue/green colour due to reflection of light from the high levels of calcium carbonate it contains. These ponds are also significant because they represent the only known locality where Betta simplex can be found. Mature females are usually rounder-bellied and often a little larger than the slimmer, more colourful males. An alternative method of sexing is to examine the shape of the dark wedge-like marking on the flanks of the fish; in males this tends to have a sharper, more well-defined outline whereas in females it has a ’rounded’ appearance. 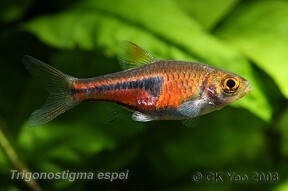 T. espei is sometimes referred to by the alternative vernacular names ‘false harlequin’ or ‘Espe’s rasbora’. It can be confused with the similar-looking T. heteromorpha and T. hengeli although on close inspection they’re actually quite easy to tell apart. T. somphongsi is the fourth, exceptionally rare, member of the genus but is very easy to distinguish from the others as the dark body marking is reduced to a narrow stripe. I greatly enjoy this fantastic website with detailed info about aquarium fishes. About the distribution of this species, I can confirm that this is without any doubt widely present on the Phu Quoc island, the largest vietnamese island located near the cambodian shore. Unfortunately, I cannot post up here the photos of the specimens I caught during my short trip last week-end. I also caught a few fishes of the betta family, possibly betta simplex, in the same stream with brown acidic water, not much submerged vegetation. Hi, can you email the photos to us or post in the forum maybe? It would be interesting to see them!